Daniel Negreanu raised and Scott Seiver reraised. David Chiu called and Negreanu also called. Seiver and Negreanu then each called two and Chiu drew one card. Chiu bet and both opponents called (Seiver called all in). Chiu stood pat and Seiver drew one card. Negreanu drew two cards. Chiu stood pat on the next round and both Seiver and Negreanu drew one card each. Chiu bet and Negreanu folded. 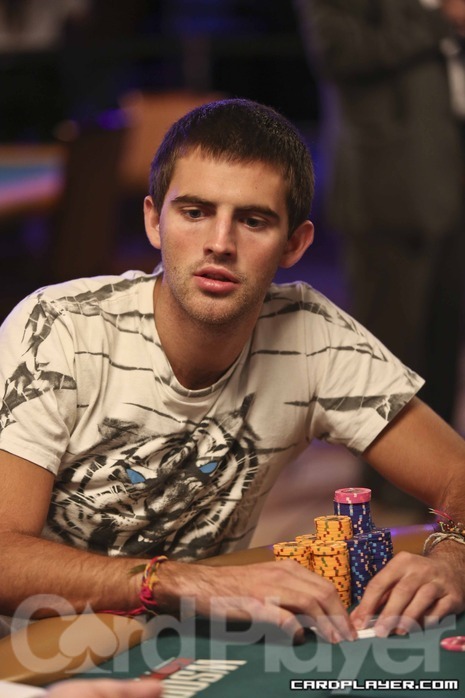 Chiu then flipped over 7-6-5-3-2 and Seiver showed a queen as he got up from the final table. Seiver was eliminated in sixth place and Chiu grew chip stack to 350,000 after the hand. The final table of Event No. 59 ($2,500 Limit Deuce-to-Seven Draw Lowball) has begun, and Card Player will be posting level-by-level updates with all major hands, current chip counts, and prize payouts. Scott Seiver posted the bring-in and David Chiu completed. Seiver called, and on fourth street Seiver bet to start the action after Chiu checked. Chiu raised to 50,000 and Seiver called. On fifth street Chiu bet and Seiver called. Sixth street brought a bet from Chiu and Seiver raised all in for 60,000. Chiu called and Seiver was in the lead with two pair, fours and threes. Chiu made a better two pair on seventh street, jacks and tens, and he won the pot and the tournament. Seiver was eliminated in second place and he took home $89,980. Chiu was awarded the top prize worth $145,520 and an impressive fifth gold bracelet. David Chiu completed and both Freddie Ellis and Scott Seiver called. All three players checked fourth street and then Ellis bet out on fifth street. Chiu raised and Seiver folded. Ellis called and then Chiu bet again on sixth street. Ellis called all in for 25,000 and he was drawing dead with a pair of nines to the full house held by Chiu, fives over sevens. Ellis was eliminated in third place and Chiu would take a stack worth 1,080,000 into the heads-up final against Seiver (820,000). 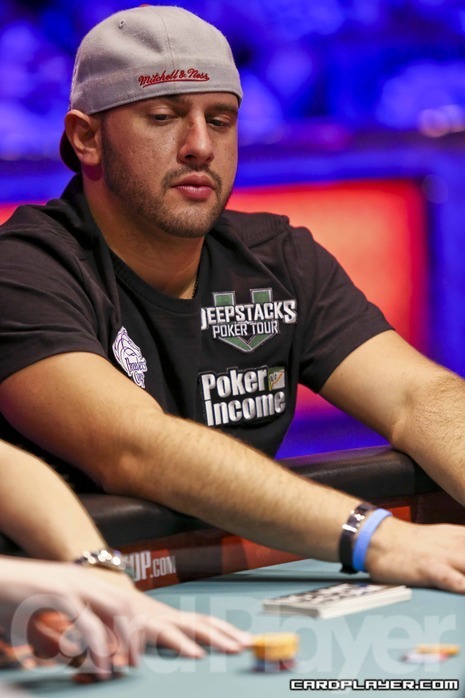 Michael Mizrachi was all in for 18,000 after he completed in a hand against Scott Seiver. Scott Seiver took the lead and his final hand of trip fours was enough to top the missed straight draw of Mizrachi. Seiver was up to the chip lead after the hand with close to 900,000 and Mizrachi was eliminated in fourth place. Scott Seiver completed and David Chiu raised. Seiver called and then both players checked fourth street. On fifth street Seiver bet and Chiu called. Seiver bet on sixth and Chiu raised. Seiver called and on seventh street Seiver bet and Chiu called all in. Chiu held a Broadway straight to win the hand and double up to 250,000. Seiver took a hit but he still ended the level with a chip lead of 805,000. Scott Seiver completed and Freddie Ellis called. Matthew Ashton called all in for 17,000 and then Seiver opened the action again on fourth street. Ellis called and on fifth street it was Ellis who bet. Seiver called and the action reversed once again on sixth street. Seiver bet first but Ellis raised to 48,000 Seiver called and then both live players checked on seventh street. Ellis showed the winning hand of (5 2 ) 5 7 5 10 (9 ) and Seiver mucked. Ashton could only muster two pair and that was behind the trip fives of Ellis. Ashton was out in seventh place and Ellis was close to 500,000. Freddie Ellis completed and Gary Benson raised. Ellis called and on fourth street Ellis bet. Benson called all in for 4,000 and he was already behind the trip tens of Ellis when they revealed their first four cards. Benson wasn’t able to catch Ellis’ (10 7 ) 10 10 Q K (5 ). Benson was out in sixth place and Ellis continued to build his stack. Frank Kassela completed and Scott Seiver raised. Kassela called and then checked on fourth street. Seiver bet and Kassela called. Kassela bet 24,000 on fifth street and Seiver called. 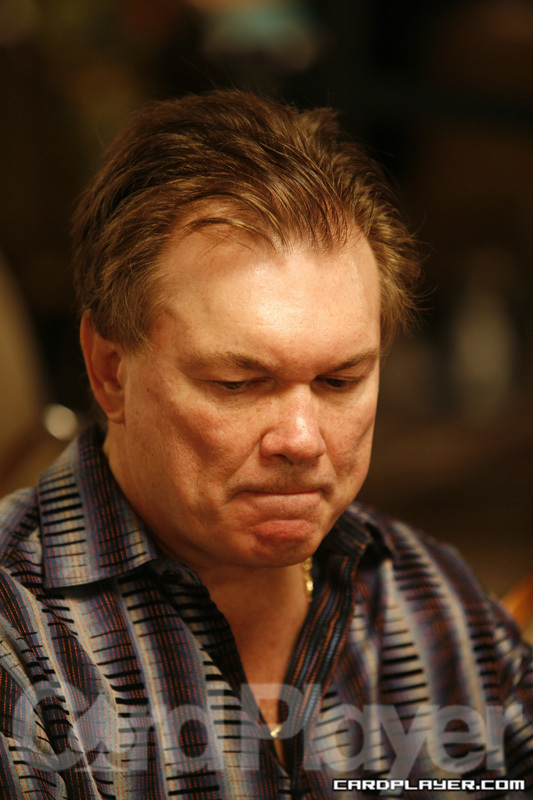 Kassela moved all in for 13,000 on sixth street and Seiver called once more. Here is how things looked after seventh street. 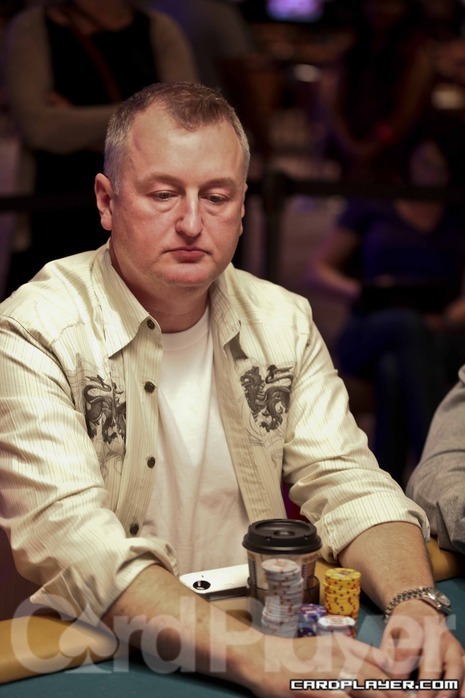 Kassela was eliminated in fifth place thanks to Seiver’s two pair and Seiver was over 900,000 after the hand. On a board of 9 8 2 K , Jon Aguiar checked-called a bet of 3,000. The 3 on the river prompted a check-call of 7,000. Aguiar’s opponent showed a set of nines and that was good. Aguiar fell to 20,000. Mike Matusow called 800 from the small blind with pocket eights, and the big blind also called. The flop came A 8 2 , and Matusow bet 1,100. One opponent called and the other raised to 2,500. Matusow called. The Q on the turn prompted a check-call of 5,500 from Matusow. The river was another eight, giving Matusow quads, and he checked. His opponent brutally checked behind and that was that. Seiver had A-K and put another player all in. However, his opponent woke up with aces and Seiver was in horrible shape. The board ran out Q 9 6 5 5 , and Seiver was left with just 7,500. Scott Seiver raised to 600 in early position and got two callers including a player in middle position and J.C. Moussa in the big blind. The flop came down K 9 3 and Seiver continued with a bet of 1,200. The middle position player called and Moussa folded. The turn was the 8 and Seiver check folded to a bet of 1,650. He now has just 16,475 in chips. Jake Cody hasn’t had a great day at the tables, but a few hands have gone his way this level to bring him closer to his starting stack. On a recent hand, a player raised and Cody called from the button. Vivek Rajkumar called from the small blind as did the big blind as well. The flop came 4 4 3 and everyone checked to Cody, who bet 1,500. Everyone folded and he chipped up to 19,000. A player raised from under the gun and Jose “Nacho” Barbero moved all in from the button for his last 5,425. The blinds folded and his opponent called, revealing pocket sevens. Barberto showed A Q , but was unable to connect on a board reading 9 3 2 5 10 . Michael Mizrachi fought hard to battle back after a cooler early on in the first level, but ultimately couldn’t find his way back to his starting stack. Mizrachi made his final move with K 10 and was called by pocket nines. The board failed to provide any help and Mizrachi was eliminated. Zolotow doubled up on the hand to survive. Frank Kassela pinned his tournament hopes on A 3 from the small blind and Jake Cody made the call with pocket eights. The board ran out Q J 10 9 7 and Kassela was eliminated on the hand. In one of the more notable matches of the second round Erik Cajelais has topped Scott Seiver to advance to the round of 32. NOTE: Day 1A has come to a close. Stay tuned for a recap of the day’s event and be sure to tune back in tomorrow at noon PST for day 1B action from The Big Event at the Bicycle Casino. 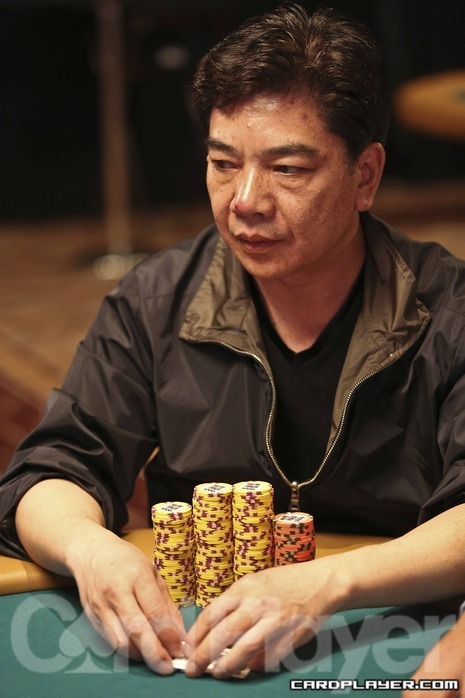 Cheong doubled up on the hand to survive with over 60,000. Stein was eliminated on the hand during the last level of play for the night. Scott Seiver raised to 2,700 from the hijack and was called by Albert Winchester in the big blind. The flop fell 10 6 3 and Seiver continued with a bet of 2,700. Winchester called and the turn was the A .
Seiver bet 4,800 and once again, Winchester called. The river was the 8 and Winchester checked once again. Seiver bet 9,200 and after a moment of thought, Winchester check-raised to 24,200, leaving himself with 29,000 behind. Seiver spent several minutes in the tank before nonchalantly throwing in the call and Winchester announced that he had a ten. Seiver turned over A 7 for the winning hand and took the pot, increasing his stack to 155,000. After riding the short stack for the last five levels, Scott Seiver has finally been eliminated from the tournament. Seiver made his last push with pocket fives and Clayton Newman had him covered with pocket jacks. The board brought no help to Seiver and he was eliminated. Newman now has just over 300,000 in chips. Shannon Shorr raised to 800 and the player in the cutoff made the call. The flop came down K 6 5 . Shorr led out for 1,300 and his oppoonent raised to 3,150. Shorr called and the turn was the 3 . Both players checked and the river was the 4 . Shorr fired 2,850 and his opponent made the call. Shorr then showed 8 7 for an eight-high straight. His opponent mucked and Shorr was at 42,000. Scott Seiver raised to 1,000 from under the gun and received one caller. The flop came down J 8 2 and both players checked. The turn was the 10 and Seiver checked again. His opponent bet 1,100 and Seiver made the call. The river was the 7 and Seiver checked again. His opponent fired 2,300 and Seiver made it 7,500. His opponent laid it down and Seiver was at 64,000. The player in the cutoff put in a raise and Isaac Haxton moved all in from the small blind for just 3,175. His opponent made the call. Haxton was dominating and the board ran out Q Q 2 8 6 , allowing Haxton to double up to almost 9,000. Unfortunately for Haxton, he would bust later in the level. Picking up the action on the flop, the board read 9 3 3 and a player bet 1,200. Praz Bansi made the call and the turn was the 6 . The player bet 3,200 and Bansi made the call. The river brought the A and the player kept firing with 6,800. Bansi made the call and turned over 10 10 to better his opponent’s K J .
Bansi took the pot and he was at 63,000. Picking up the action on a flop of 9 7 6 and a player bet 1,800. Chris Moneymaker made the call and the turn was the 10 . The player bet 3,200 and Moneymaker raised to 8,200. His opponent moved all in and Moneymaker made the call. The player turned over K K but Moneymaker had J 8 for the straight. The river was the 2 and Moneymaker scored the knockout. He was at 59,000. Note: Players have gone on a 90-minute dinner break and will return at 8:15 p.m.
A player raised to 800 preflop and Jimmy Fricke moved all in for 3,350 from the button. The small blind then repopped to 6,500 and the other player mucked. Fricke was in trouble and the board ran out 7 5 3 5 6 and Fricke was eliminated. The board ran out 9 8 4 10 5 and Ho scored the knockout. She improved to 78,000 after the hand. Picking up the action on the turn, the board read J 8 4 5 and Chris Moneymaker checked. His opponent bet 1,500 and Moneymaker check-raised to 6,500. The opponent called and the 10 fell on the river. Both players checked and the opponent tabled K K . Moneymaker mucked and he was down to 33,000. Picking up the action on the turn, the board read Q 3 2 7 . Scott Seiver checked and his opponent fired 900. Seiver made the call and the 9 fell on the river. Seiver checked and his opponent did the same, much to the chagrin of Seiver as he tabled 9 9 for a rivered set. Despite not getting much action, Seiver took the pot and he was at 48,000. Picking up the action on the flop, the board read A 9 2 . The player in seat 7 fired a bet and Michael Mizrachi raised it to 8,000. Two other players got out of the way and the action was back on seat 7. He instantly moved all in for 13,000 more and Mizrachi made the call. Seat 7 flopped top pair but Mizrachi was drawing to the flush. The turn was the 6 and the river was the 3 and Mizrachi could not get there. He dropped the pot and was at 84,000. A player raised to 800 preflop and Ted Forrest made the call. The flop then came down 8 4 3 and Forrest checked. His opponent bet 1,100 and Forrest check-raised to 3,000. His opponent then moved all in and Forrest made the call with his last 9,000 to put himself at risk. Forrest tabled A A while his opponent showed 9 8 for top pair on the board. The turn was the A , giving Forrest a lock on the hand. The meaningless river was the 5 and Forrest doubled up to 20,000. Picking up the action on the flop, the board read 8 4 2 and a player bet 800. Steve Wong made the call and the turn was the 2 . Both players checked and the A fell on the river. Wong bet 1,200 and his opponent made the call. Wong then tabled 5 3 for a wheel and his opponent mucked. Wong took in the pot and he was at 49,000. 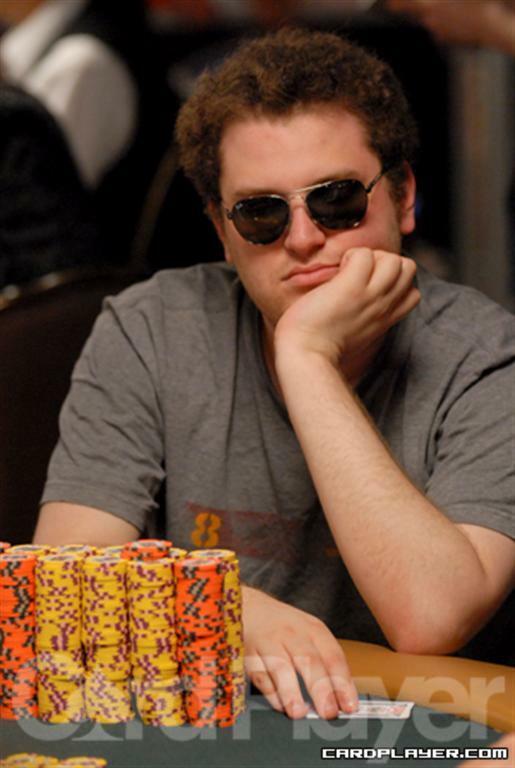 Three players limped in preflop, including Scott Seiver from the small blind. The flop then came down K 7 3 and Seiver led out with 750. The big blind mucked but the other player made the call. Both saw the 10 on the turn and the other player bet 1,250. Seiver made the call and the 10 came on the river. Seiver bet 3,300 and his opponent made the call. Seiver announced he had two pair but was shown 6 5 for the flush and the winning hand. Seiver was down to 38,000 after the hand. Isaac Haxton raised to 700 from the cutoff and he was called by the big blind. The flop then came down K J 10 and Haxton bet 1,125. The big blind called and the 9 fell on the turn. Haxton bet 2,550 and the big blind stuck around. The rive was the A and Haxton kept at it with another 6,375. The big blind finally mucked and Haxton flashed the 7 . He raked in the pot and he was at 45,000. Maria Ho raised to 675 from the cutoff and she was called by the big blind. The flop fell 6 3 3 and both players checked. The turn was the J and the big blind bet 1,600. Ho made the call and the 2 fell on the river. The big blind check-called a 3,200 bet from Ho, who then tabled 6 6 for a flopped full house. The big blind mucked and Ho was at 57,000. Veldhuis nailed the flop of 9 7 5 and the big blind found no help from the 7 turn and 2 river. Veldhuis eliminated his opponent and chipped back up to 96,500. With a flop of A 9 5 on a pot worth 16,500 already, all three players checked around to see the 2 land on the turn. South had flopped top set and his opponent had second set. The river bricked and South took down a massive pot to grow his stack to 223,500. Thayer Rasmussen got an opponent all in preflop and showed pocket jacks to his opponent’s pocket nines. 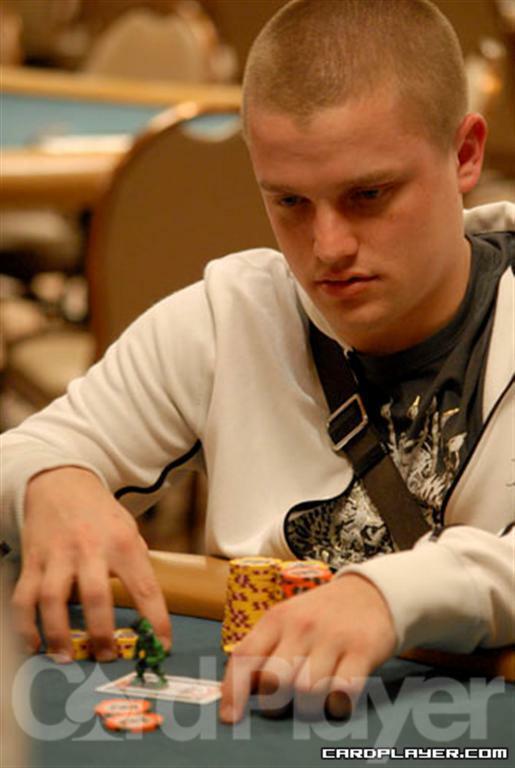 The board ran A K 3 7 5 and Rasmussen’s jacks held to eliminate him opponent and chip up to 96,000. 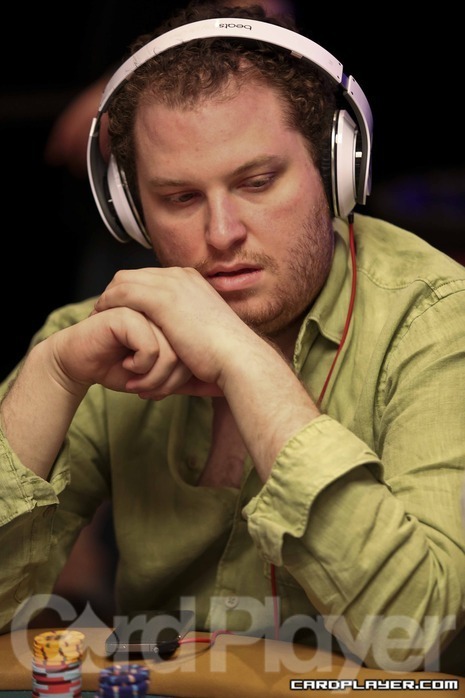 Isaac Baron raised to 1,700 from middle position and was three-bet by a player in the blinds to 4,800. Baron asked how much he had left, and after getting an answer, he made the call. The flop was 9 3 8 and the player in the blinds checked over to Baron. Baron bet 4,800 and was check-raised to 15,000. Baron bet enough to put the player all-in and he called, putting in his last 30,950 on the flop. Baron showed 3 3 , giving him a set and the all-in player held J J . The turn was the 10 , but the river was the J , giving the player in the blinds a bigger set and taking the pot. Baron dropped to 35,000 after the hit. Matt Glantz called a bet of 2,200 on the turn from his opponent with the board reading A J A 5 . The river was the Q and the other player in the hand gently places an orange chip worth 5,000 onto the felt. Glantz quickly released his hand. It was a good decision since the player showed him one card – the A .
Glantz is still hovering right around his 30,000 original starting stack. On a three-way flop of Q 4 5 the small blind bet 1,500 and Michael Mizrachi called from the big blind. The third player in the hand raised to 8,400 and the small blind folded but Mizrachi called. On the 3 turn both players checked, but on the 3 river Mizrachi bet big â€” 20,000 to be exact. His opponent called and the Grinder showed 6 3 for a flopped straight draw that turned into trip threes on the river. After a rough start to the day, Mizrachi took the pot and boosted his stack to 97,000. Pham had his opponent dominated, that is until the board ran out 10 Q K J to give Pham’s opponent the straight, then the 7 river added an unnecessary flush, cracking Pham’s aces and sending him to the rail. Pham ended the 2010 WSOP with just one cash. Check out his results here. Ho was a big favorite, and the low board kept it that way, running 6 8 6 3 2 . Ho’s hand took down the pot and she doubled to around 31,000. Picking up the action on the turn, the board read 9 3 2 10 . Scott Seiver checked and his opponent did the same. The river was the J and both players checked again. Seiver tabled 9 8 for a pair of nines. His opponent mucked and Seiver took down the pot. He was at 72,000 after the hand. After one player checked, Ralph Perry bet 5,000 on a flop of J 6 2 . Sandra Naujoks made the call in position and the other player folded. The turn was the 3 and Perry checked. Naujoks fired 5,000 and Perry came back with a check-raise to 15,000. Naujoks went into the tank for a minute or so before releasing her hand. She slipped to 40,000 while Perry climbed to 140,000. Ted Forrest got all of his chips in preflop with 5 5 against his opponents A K .
After the ESPN cameras got there, the dealer put out a flop of Q 10 2 , giving his opponent a ton of outs to improve. The K on the turn gave his opponent the best hand and left Forrest with one out. The A on the river gave the pot to his opponent and Forrest was eliminated. If you check out the Card Player poker odds calculator, you can see that even though the A-K didn’t pair up on the flop, it was still a statistical favorite to win the hand. Forrest is eliminated from the main event and this caps off a very disappointing series for Forrest, who only made one cash in 2010, in the $2,500 2-7 triple draw lowball event for $9,972. After passing by Scott Seiver’s table, we overheard him talking with David Bach about making a run at the U.S. Olympic Curling team. “It probably does, we would just have to figure out who is going to sweep,” replied Seiver. There was a joking tone, but it wouldn’t surprise us to see those two on the ice in four years. Picking up the action after the flop came down 10 8 2 , the player in seat 8 fired 1,300 into a pot of about 2,000. 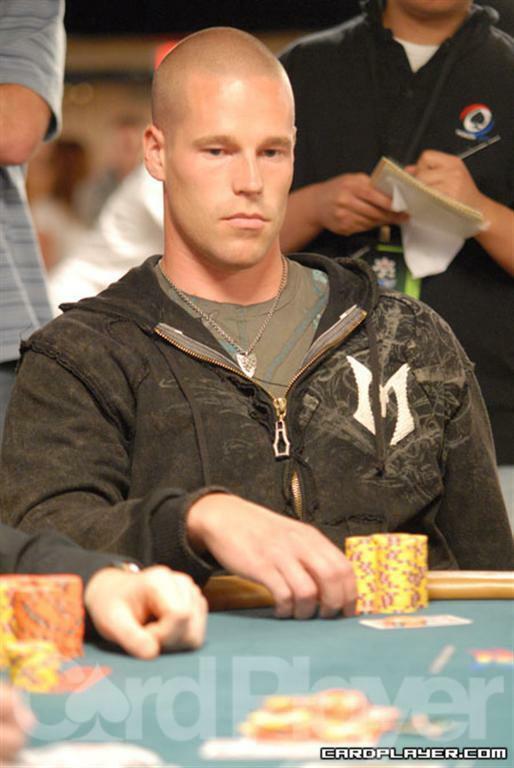 Patrik Antonius made the call and the turn was the 9 . Seat 8 led out with 3,300 and Antonius threw in the call once more. The river was the 10 and seat 8 led with 10,300. Antonius thought for a bit but released his hand into the muck. He was at 244,000 after the hand. Daniel Negreanu raised to 2,200 from under the gun and the player in the big blind made the call. The two players saw a flop of K 7 2 and Negreanu led with 2,500. The big blind called and the turn was the A . The big blind checked and Negreanu did the same. The river was the 6 and the big blind checked again. Negreanu fired 5,600 and that induced a fold. Negreanu took down the pot and he was at 33,000. Bernard Lee raised to 2,700 from the button and was called by the player in the big blind. The flop came K 2 Q and Lee fired out 3,400 after the big blind checked. Both players checked when the A peeled off on the turn. The 10 came on the river and now the big blind led out for 18,500 and Lee moved all-in. His opponent made the call and Lee tabled A 6 , giving him the nut flush and he doubled up to 195,000 in chips while eliminating his opponent. Robert Lang got all his money in the middle preflop against Vanessa Rousso. Lang showed Q Q and Rousso showed A A . A third queen fell on the flop and Rousso dropped to 80,000 while Lang’s stack doubled up to 40,000. Paul Wasicka was in the big blind with the A J when a player on the button moved all in for about ten big blinds. Wasicka called and was his opponent tabled the 10 7 . The board ran out A Q 3 2 3 and Wasicka took the pot with a jack-high flush. He was up to about 65,000 after the hand. On a flop of 6 8 3 , Jason Cole led out into Johnny Chan for 5,000. Chan made a raise to 12,000 and that prompted Cole to move all-in for 28,400 and was called by Chan. Chan showed 10 10 and Cole tabled A 8 . Chan was way out in front and stayed ahead when the 3 came on the turn and the J fell on the river. Cole gets to go home early and Chan vaults to 390,000 in chips. Picking up the action after the flop came down K 9 4 , Michael Mizrachi led out with 3,000. Sandra Naujoks then raised to 8,000. Mizrachi repopped to 18,000 and Naujoks threw in the call. The turn was the 2 and Mizrachi fired 25,000. Naujoks threw in a relatively quick call and the two saw the 10 fall on the river. He turned over 4 4 for bottom set on the flop and Naujoks mucked in disgust. She was down to just 11,500 while Mizrachi elevated his stack to 286,000. Ryan Young’s opponent moved all in for 11,700 with the K K . Young called him with the J J . The board ran out A Q 4 A 4 and Young doubled up his opponent. Young was still at over 200,000 after the hand. On a board of Q Q J A Richey bet 11,600. His opponent deliberated before finally calling. The 2 fell on the river and Richey bet 27,500. His opponent tanked before finally folding. Richey was at 105,000 after the hand. A player bet 2,400 and Scott Seiver raised to 7,100. A player in the big blind called. The original bettor folded. The flop came Q 8 7 and the big blind checked. Seiver bet 10,000. His opponent shoved and Seiver called. He exposed the A Q while his opponent tabled A A . The turn and river were bricks for Seiver and he was left with just 3,000 after the hand. He was eliminated shortly thereafter.